AAEA invites you to register for the 2019 AAEA Annual Meeting in Atlanta, GA, July 21-23. Most meeting events will take place at the Atlanta Marriott Marquis hotel. Be sure to reserve your room early - they are expected to run out in May! Reserve here to receive the AAEA group rate of $199. Before you book, be sure to check out our list of extra events listed below. American Airlines is offering a discount when traveling to Atlanta for the AAEA 2019 Annual Meeting. Visit the Travel Options webpage for details. 2019 Travel Grants are now open for applications. These grants defray housing and transportation costs associated with attending the 2019 AAEA Annual Meeting in Atlanta, on July 21-23. The amount of the travel grant awarded will depend on the number of applications received. There are Travel Grants for both International and Domestic travel. The deadline for the 2019 Travel Grants is May 15, 2019. Notifications will be sent in June. This year there are a number of luncheons and pre/post-conference workshops to choose from. Review the Section Lectures & Luncheons and reserve a spot for Monday, July 22. Space is limited, so register early to reserve a place to hear the lecture, enjoy lunch, and network! This year we also have four pre-conference and four post-conference workshops, all of which offer great educational opportunities. If you are interested, be sure to register early and reserve your hotel room for the extended day. 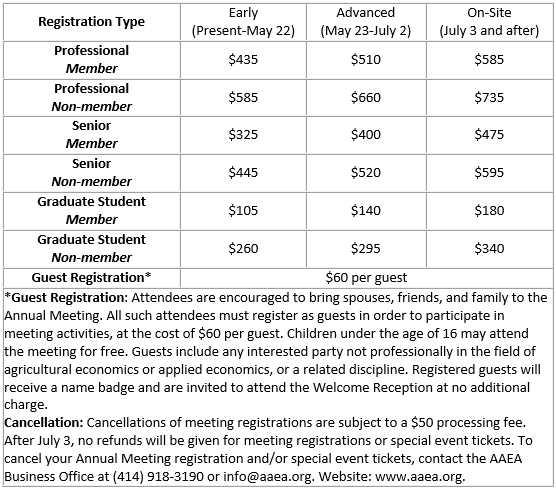 Below you will find registration rates for the 2019 AAEA Annual Meeting. The earlier you register the more you save! You can register online here and find our registration form here. AAEA award winners will be notified at the end of April.